Pleased to meet you! 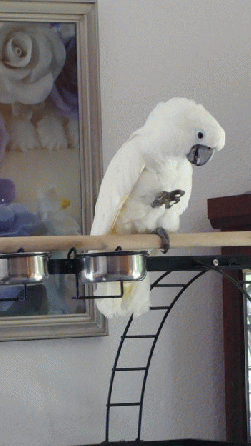 My name is Angela, and I`m a happy, confident girl of around 25 yrs old--that`s about early- to mid-adulthood for us umbrella cockatoos! I`ve lived most of my life with just one human household, until my human daddy passed away. At that time a very nice family took me in. I don`t think they`re able to take care of me the way they want to anymore, though, so they`ve asked Mickaboo to find me a perfect match of a people-family. I like most of the human people I`ve met, they`re fun to watch and listen to, and they give me very nice head-scratches and preening! My wings haven`t been trimmed in a long time! Maybe you`ll want to give me a new style if I come to live with you? My people have been feeding me yummy things like fruity pellets, bananas, nectarines, grapes, peanuts in their shells, and something called Avi-Cakes. My favorite foods would have to be fruits, but I`ve never really developed a taste for people food. I haven`t developed a taste for saying people-words, either, or whistling people-songs, though I do like it when humans talk to me softly and sweetly. Some say I get a bit, well, not so soft-and-sweet in the morning when I want to come out, and in the evening when it`s time to be covered up for bed, but hey, I just need to make myself heard sometimes! For a while now, I`ve gotten to come out of my cage all on my own about three or four times a week, for several hours each time. Ah, the luxury of being able to explore and stretch my wings and socialize with my featherless family! Oh, and I`ve heard that some of my kind will sometimes bite one of their humans painfully, but I myself would NEVER consider such a thing. Why, if I did that, people might stop preening and petting me, and giving me those delicious fruits! That would make life simply abyssmal, as I just love being around you odd-looking creatures. Once in a while a new person might make me a little nervous, but in those cases I just move away to observe from a safe distance. I REALLY enjoy going outdoors, and nothing much scares me. So, what are you waiting for? Get in touch with my Mickaboo cockatoo coordinator so I can meet you, and see if you`re the one for me!